Optimum's Low Profile Bunding Stations are the economical solution to spill concerns during drum filling and dispensing operations. They are ideal for chemical or battery storage needs. Seamless construction in 100% polyethylene eliminates leaks and is nearly impervious to chemicals including acids and corrosives. Sturdy, self-locating grates eliminate the chance of ride-up and remove for easy cleaning. 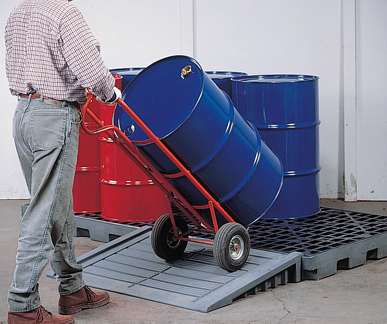 Companion Ramp facilitates loading and unloading of heavy drums and features anti-skid ribs for maximum safety. It can be conveniently located anywhere, on any size Centre. Combine 2-, 4-, 6, and 8-drum modular units to create your own customised system. As capacity needs increase, use optional Joining Clips to firmly lock units together and expand your storage space. 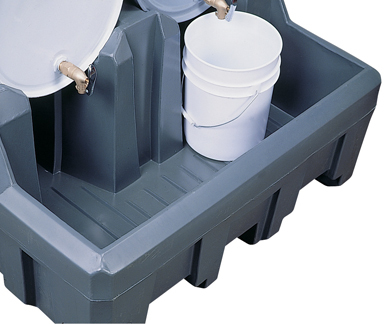 Sumps remain separate and Clips can be removed for easy repositioning. In applications calling for a continuous sump, optional Sump-to-Sump Drain Kit, (including joining clips and transfer tube) allows you to join Centres together, on-site, for full compliance with EPA regulations when increased combined sump capacities are required. Low profile design is ideal for storing, collecting, dispensing, and more! If you'd like more information or if you have any enquiries about the Low Profile Bunding Stations, please call 1800 066 008 or click HERE to contact us online and we will contact you. 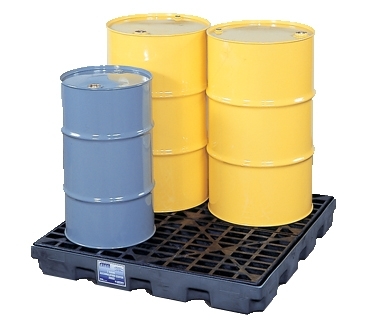 These spill containment pallets are available from 1-drum to 4-drums. Hard cover and pallet rack models also available. 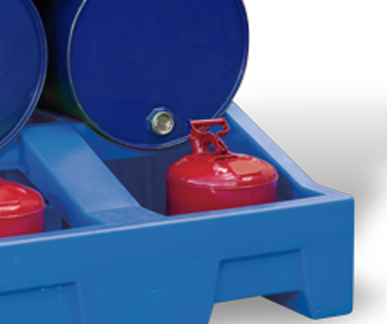 They are rated to hold drums up to 230 litres capacity. 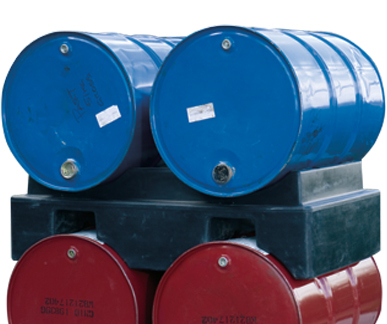 Optimum has a wide range of spill containment and drum decanting and handling solutions to satisfy Environmental Protection requirements. These products are extremely cost effective, hardwearing and flexible in possible configurations. 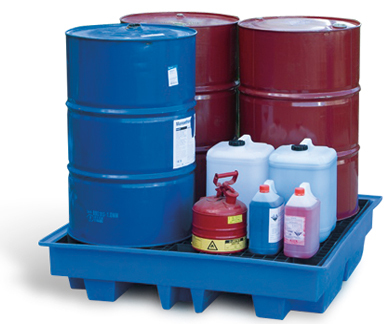 Safe Storage, Decanting and Waste management are all handled with ease with Optimum's Bunding & Spill Control Range. Optimum offers the ultimate protection against leaks and spills. 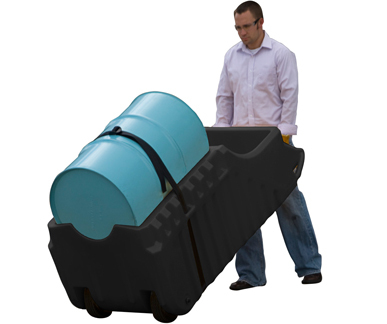 Our polyethylene products feature secondary containment to catch hazardous spills before they become a problem! Spilled liquids are captured to help prevent contaminating factory floors, drains, and outside groundwater. 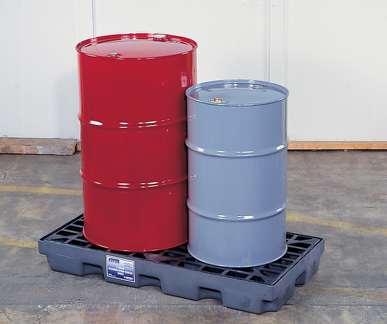 You’re not only protecting the environment but saving money in the process by reclaiming captured spills for reuse, avoiding high costs associated with hazardous material clean-up, preventing slip and fall injuries to safeguard employees and avoid worker’s compensation claims and avoiding fines with compliance to EPA regulations Optimum also helps to organise your drum storage, segregate liquids for easy identification, and makes drum handling safer and easier. 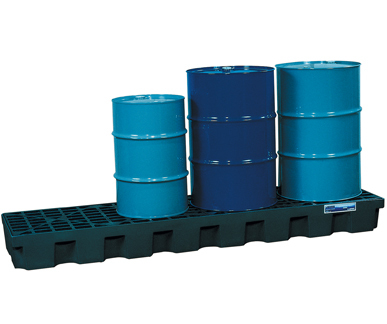 If you'd like more information or if you have any enquiries about the Spill Control Pallets, please call 1800 066 008 or click HERE to contact us online and we will contact you. These Bunded Drum Dispensing Unit is a stackable design, the Drum Stacker enable horizontal stacking of 205L drums. 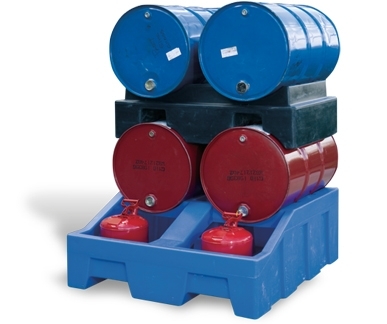 Modules combine efficient drum storage, positive spill control and safe liquid dispensing. The Optimum Drum Management System meets safety and environmental protection requirements while organising drum storage for maximum efficiency, productivity, and cost savings. 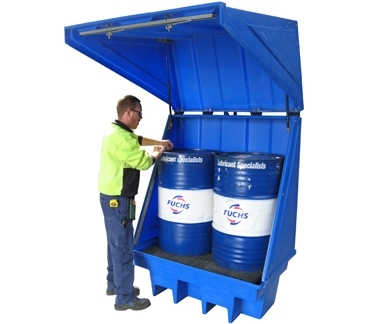 The design accommodates either 60 or 205 Litre drums of flammables and combustibles liquids. 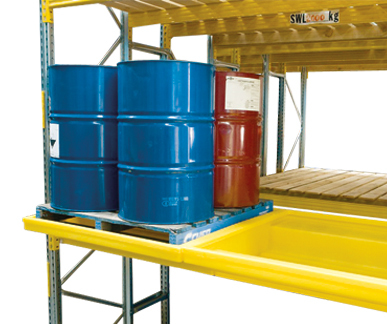 Space-saving design is also ideal for storage of non-hazardous liquids. UV protected polyethylene construction provides maximum chemical compatibility and resistance – preventing corrosion and deterioration, assuring a long lifetime of service. Molded-in drum lock channels hold drums in place. Is the key component of the system. It is designed to accommodate two drums with a load capacity of 675 Kg. in total. The dispensing well conveniently holds either 20 Litre safety cans or 20 Litre pails. Forklift channels facilitate relocation within the plant. 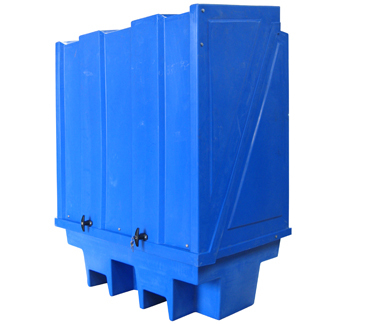 The system’s generous 205 Litres “open view” spill containment sump is located in the module. 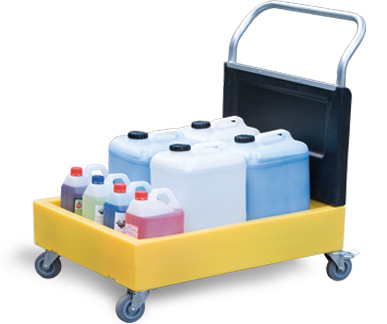 Spills, even drips of hazardous chemicals, are easy to spot and quickly cleaned up with this wide open design. It doubles system capacity holding two additional drums. Load capacity is 675 Kg. 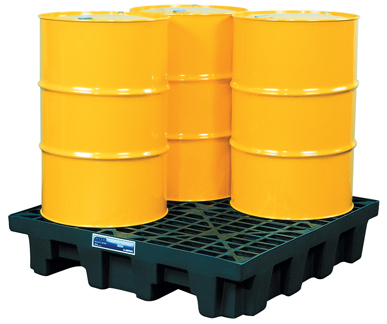 When storing both 205 or 60 Litre drums the smaller drums should be placed on top, in this stack module. Do not mix lower drum sizes when double stacking. With a load capacity of 25kg, mounts securely to the stack module for convenience in dispensing from the upper level. OH28241 Safety strap - black nylon with cinch buckle, 1800Kg. If you'd like more information or if you have any enquiries about the Drum Management System, please call 1800 066 008 or click HERE to contact us online and we will contact you. 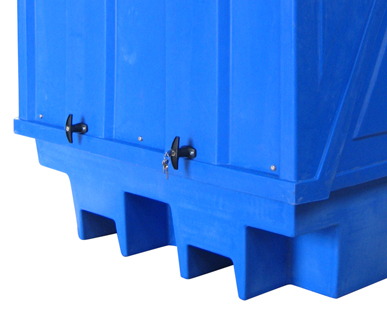 The Hard Cover Drum Bund are ideal for outside or temporary storage needs, they are weatherproof and are lockable for security purposes. 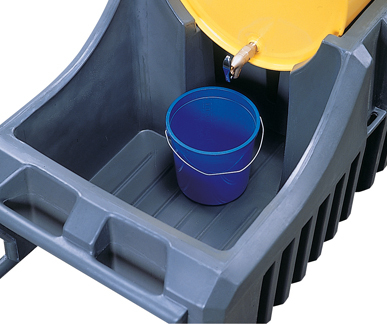 Spill Containment Caddy is a safe, easy way to secure drums and contain leaks and spills. It is an innovative solution to moving and decanting awkward and heavy containers. 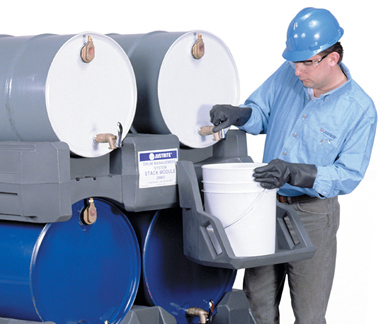 The Optimum single solution for drum handling safety, mobile dispensing capability, and built-in spill containment! 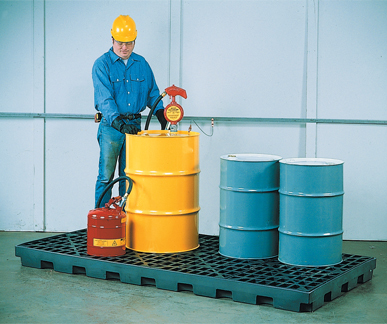 The Spill Containment Caddy offers you convenient handling and dispensing of hazardous chemicals with complete assurance of compliance with EPA and OSHA regulations. It is the ideal choice for managing either 205 or 60 Litre drums; nylon strap holds drum securely in place. 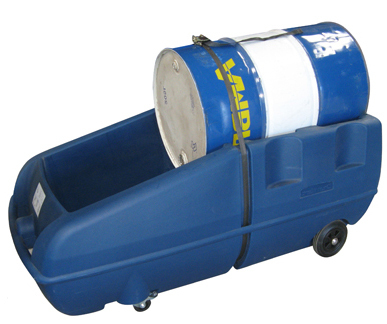 Drum Management - Transport up to 275 Kg. loads easily and safely, minimising back strain and injuries. Ergonomically designed for tipping, with back kickplate positioned to assure weight is not absorbed by the spinal column. Big rounded handles accommodate heavy work gloves for comfortable gripping. Large 25.4 cm wheels roll easily over shop floors. 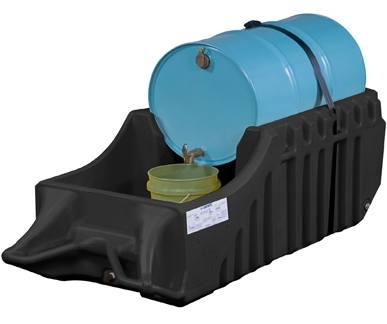 Should a spill occur, or even if the drum leaks or splits a seam, the oversized 250 Litres spill sump will contain the chemical eliminating both the hazards and hassles of a chemical spill in your facility. Exclusive “open view” sump design makes clean-up simple and quick. One piece double-walled body adds strength and eliminates leaks. Spills are contained within unit, not between walls as in similar products. Gator protected polyethylene construction provides maximum chemical compatibility and resistance preventing corrosion and deterioration, assuring a long lifetime of service. 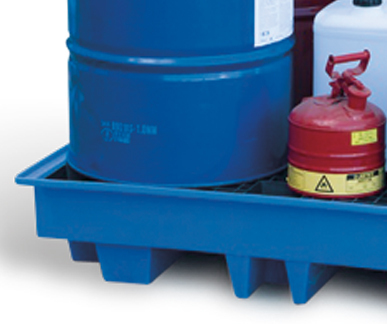 If you'd like more information or if you have any enquiries about the Spill Containment Caddy With Handles, please call 1800 066 008 or click HERE to contact us online and we will contact you. 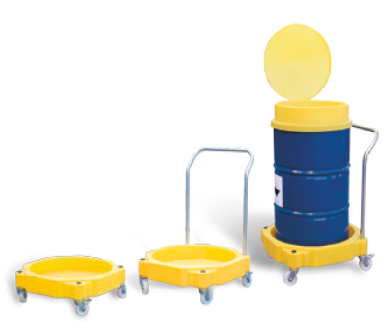 Optimum's Drum Handling Equipment range ensures industrial safety and effective spill control with products that include; Poly Bunded Trolley, Drum Dollys, Spill Funnel Lid with Debris Strainer, Poly Racking Bund and Mobile Waste Manager.